SAINT PETER, Minn. – During its 50th season celebration Saturday, the No. 12 Gustavus volleyball team defeated Bethel in straight sets at Gus Young Court, improving to 12-2 overall and 3-0 in the MIAC. The Gusties won by scores of 25-13, 25-21, and 25-15, handing the Royals their first conference loss of the season (12-3, 2-1 MIAC). Nora Holtan (Sr., Rochester, Minn.) finished with 27 assists and moved into second place in the Gustavus record books with 4,023 career assists. Holtan becomes just the third Gustavus volleyball player to reach 4,000 career assists and passed Rachel Batalden’s (2001-04) mark of 4,012. Only Jess Lobben’s (1993-96) program-record 4,201 assists stand in Holtan’s way. “The team came ready and competed well in the match today,” Head Coach Rachelle Sherden said. “Today was a momentous celebration for Gustavus volleyball. Of the nine years I’ve been here, it was one of the coolest and most special events I’ve been a part of. We had the former coaches and alums back from from every era on campus for the match and different events throughout the day, which culminated with a dinner banquet and speeches from former players and coaches that left everyone in the room shedding tears and rolling with laughter at different moments throughout the night. 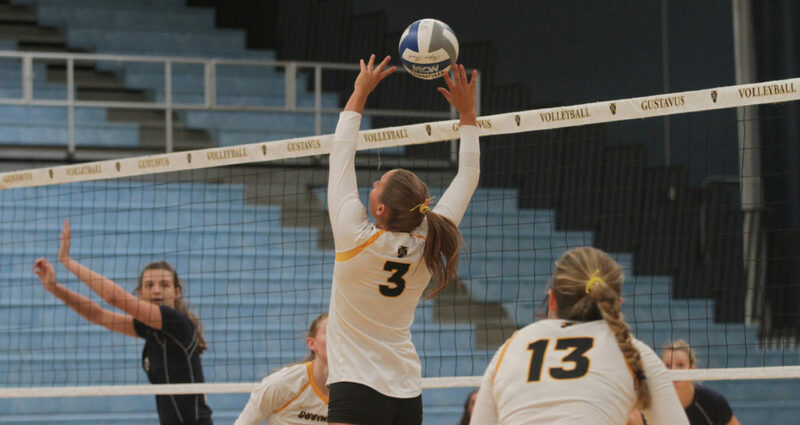 The Gusties started Saturday’s match with a decisive 12-point victory in set one. Bethel led 3-2 early on before the Gusties rattled off 10-straight points on the serve of Brittany Luethmers (Sr., Prior Lake, Minn.). The second frame proved to be a back-and-forth affair with 10 ties and two lead changes. The final lead change was 5-4 in favor of Gustavus, which was followed by seven ties, but the Royals were never able to regain the advantage. The third set was all Gustavus as it led from the onset and never trailed. The Gusties hit .255 on the attack, led by Kate Holtan’s (So., Rochester, Minn.) 13 kills. Hanna Albers (Sr., St. Louis, Mo.) posted a double-double with 10 kills and 10 digs. Luethmers was steady on the back line, digging out 15 attacks. Serving was strong for the Black and Gold as they tallied seven aces. Gustavus next travels to Macalester for a 7 p.m. match Thursday. “A big thanks to Gretchen Koehler for being a pioneer for women’s athletics and founding the volleyball program at Gustavus and Kari Eckheart for paving the path and being a mentor and support system for me and the student-athletes,” Sherden said.